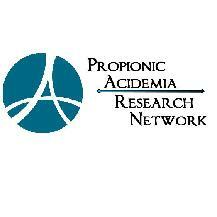 Propionic acidemia is an autosomal recessive genetic disorder of amino acid metabolism. It is the most common of the organic acidurias. In the U.S., PA is estimated to strike once in every 50,000 births. A deficiency in propionyl-CoA carboxylase (PCC) causes PA patients to produce propionic acid, methyl citrate and other toxins when a diet high in protein is consumed. PCC is a biotin-dependent enzyme that functions in the degradation of methionine, valine, threonine, isoleucine, odd-chain fatty acids and cholesterol. At present, management of PA consists of strict dietary control, with the offending amino acids greatly restricted. The challenge to the clinician is to provide adequate calories and protein for growth and development of the patient without causing adverse symptoms that could progress to ketoacidosis or a metabolic decompensation. Avoiding a metabolic crisis is of primary concern to all who are involved in the care of a PA patient. Serum amino acid levels are frequently monitored and numerous dietary changes are usually necessary to find the optimal level of nutrients for each individual. One complicating factor in treating PA is that each individual produces a unique amount of PCC. Each person's diet is therefore unique, depending on the effect of individual mutation(s) in PCCA or PCCB, the genes involved in producing PCC. The need for differing amounts of protein makes it impossible for clinicians to construct an "average" PA diet. Most PA patients develop a secondary carnitine deficiency and are therefore supplemented with L-carnitine, as well as biotin, a vitamin co-factor for PCC. Additionally, each PA patient reacts to dietary management differently depending upon the other aspects of his or her genetic makeup. Allergies, pancreatitis, diabetes insipidus, cardiomyopathy, hypoglycemia, decreased gut motility and hyperammonemia all complicate treating PA. Management of PA is a never-ending and time-consuming endeavor which must be maintained over a lifetime. Dietary control, however, is an inadequate way to treat PA. Even the most well-managed individuals suffer ongoing damage to major organs such as liver, pancreas, brain, kidneys and heart. The damage may not be seen until years after diagnosis, but constant production of toxic metabolites, even at low levels will eventually take it's toll on the body. The advent of expanded newborn screening is now allowing for the identification of new PA cases that can be treated from birth. Fortunately these children will have a chance to flourish, but major illness can still cause a rapid slide to metabolic instability. The illusion of health can quickly fade when illness causes metabolic dysfunction and a cascade of difficult to manage conditions creates a complicated set of problems for physicians. PA individuals identified early via tandem mass-spec newborn screening may live longer, but they are no less immune to the ongoing life-threatening issues that face all those living with PA.
Prevention Genetics offers PCCA and PCCB diagnostic testing in their CLIA/CAP certified laboratory. Please contact Tom Winder at www.preventiongenetics.com for more information.